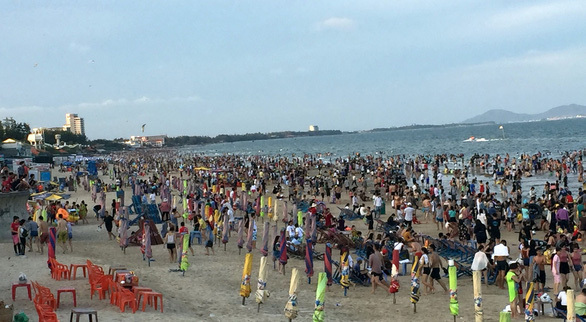 The southern beach city of Vung Tau was overcrowded on Sunday, the Hung Kings’ Festival day, as approximately 83,000 people flocked to the popular tourist destination for the holiday. Public workers in Vietnam are given up to three days off, from April 13 to 15, for the national holiday. The Hung Kings’ Festival is officially celebrated on the 10th day of the third lunar month, which falls on April 14 this year. Many people decided to spend their Sunday in Vung Tau City, located in the southern province of Ba Ria-Vung Tau, to get away from the heat that is battering southern Vietnam. Statistics showed that more than 40,000 vehicles traveled through the toll station on the section of National Highway 51 that leads to the city. About 30,000 vehicles are recorded by the tollgate on a normal day. Pham Khac To, director of the Vung Tau Tourism Management Board, confirmed that about 83,000 visitors headed to the city on Sunday. Most of the tourists spent their time on Bai Sau (Back Beach), which is adjacent to Thuy Van Street, To continued. Local authorities also tried their best to prevent tourists from bringing food and beer to the beach as well as littering in public areas. Hotels reported an 80-85-percent occupancy rate, To said, adding that room rates also significantly surged. Meanwhile, some resorts offered discounts to attract visitors during the holiday.